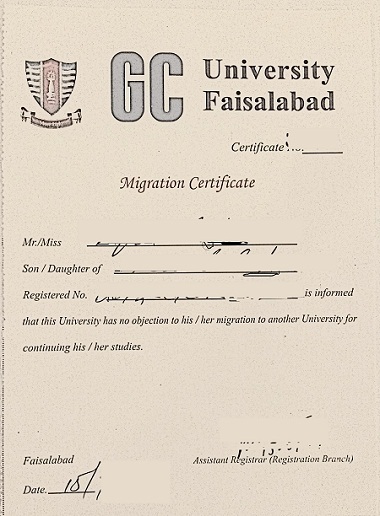 This is a sample No Objection Certificate(NOC) or Migration Certificate Format for College or University Students. You can download this free and customize as per your needs. Or simply get its print on letter head of the university. This certificate format can be used as No Objection Letter as well. Registered No. _______________________ is informed that this university has no objection to his/her migration to another University for continuing his/her studies. It is informed that Govt. College University Faisalabad has no objection to his/her migration to another University for continuing his/her education. This no objection certificate (noc) is specially designed for India, Pakistan, UAE and Europe and America. It can also be used in other countries. I have been a student of this college for the session of 2014-2016. I studied BSc from here and I have passed all the exams required to complete the degree with A grade. I was also the class representative of my section and I was active in the dramatics and declamation societies. I have represented this college in inter college debate contests and won prices. My fee and library dues are also clear. I want your best wishes and a NO OBJECTION CERTIFICATE to apply for a job. I hope my request will be granted as soon as possible as I am in dire need of a job to fulfill my expenses and sponsor my further studies. It is to inform you that Sam John is currently enrolled in our regular BS program. The institute allows Sam John to do the night shift job as it will not disturb his daily schedule. Sam has made sure that there will be no time collision and he will maintain his grades also. We testify that Mr. Donald is a bona fide student of this university. He has obtained a Master’s degree in social sciences from this university. He has been a good student with interest in sports, declamation and dramatics along with studies. His conduct and discipline have been excellent and he has proved himself a responsible part of this university. His academic record has been verified and found as per documents. This letter is being written as a no objection certificate from this university for his admission in Ph. D program in New York University. We strongly recommend him and wish him best of luck for his studies ahead.